Our range of products include maintenance man lift. Maintenance Man Lift lift can be used for maintenance work on various types of aircraft. It is also highly suitable as undercarriage for a catering container, Nandan’s Manlifts are very popular in various applications & some of them include tunneling, aircraft maintenance, etc. 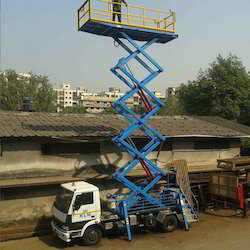 The scissor lifts are mounted on commercial chassis to take into account the ease of availability as well as maintainability. In addition to stability the option to have weight access up to 5 tons makes this versatile equipment. We offer the Man lifts at affordable prices and are available in different diversification such as 16 m scissor lift with 1 ton capacity or 9 m with 3 ton. The pantograph scissor mechanism makes it very stable to operate and a perfect solution to all the maintenance needs.